From the pair of Air Jordans Michael Vick wore in games on turf during a Pro Bowl season, to LeBron James’ first signature Nike sneaker, which eventually led to a billion-dollar endorsement deal and retro release, to Tinker Hatfield’s vision to design a sneaker based upon Michael Jordan’s catlike persona — every shoe has a story that deserves to be told. In an effort to ensure that these sneaker tales live on, The Undefeated presents a recurring series, “Sneaker Stories,” which begins with the story of a pair of shoes filmmaker, actor and sneakerhead Spike Lee had customized as a representation of his protest of President Donald Trump. On Lee’s 60th birthday, we tell this story through the artist behind the sneakers, Brooklyn’s own Danielle Mastrion aka @daniellebknyc. “He went to the same high school that my mom went to,” answers Danielle Mastrion. The question? What was it like, you know, meeting Spike Lee? For many people, this fun fact would be a footnote. An interesting tidbit, but nothing too special, right? Not for Mastrion, 34, who’s always felt a special connection to legendary filmmaker and actor Lee,who celebrates his 60th birthday today. In Mastrion’s mind, the two are kindred creative spirits for the simple fact that Brooklyn, New York — the place reflected in much of their work — is for both of them, home. Lee wanted the shoes to reflect his protest of Trump. He wanted the words “Repel Agent Orange” and “Resist” on them. The first four pairs Mastrion designed for Lee weren’t for the man himself. As filming for his upcoming Netflix series She’s Gotta Have It, which is based upon the film, drew to a close, Lee wanted a unique way to show his appreciation to the four main characters of the series. He wanted to gift each actor a pair of sneakers. But not just any sneakers. So, Lee commissioned one of the show’s writers, Lemon Andersen, with the job of finding an artist capable of customizing sneakers up to his standards of dopeness. Andersen deferred to New York artist AVone, aka Anthony Vasquez, who recommended Mastrion. Andersen scheduled a time for her to pick up four pairs of “White Cement” Retro Air Jordan IVs, which Lee wanted completed ASAP. So, time was time ticking for Mastrion. She had 24 hours. 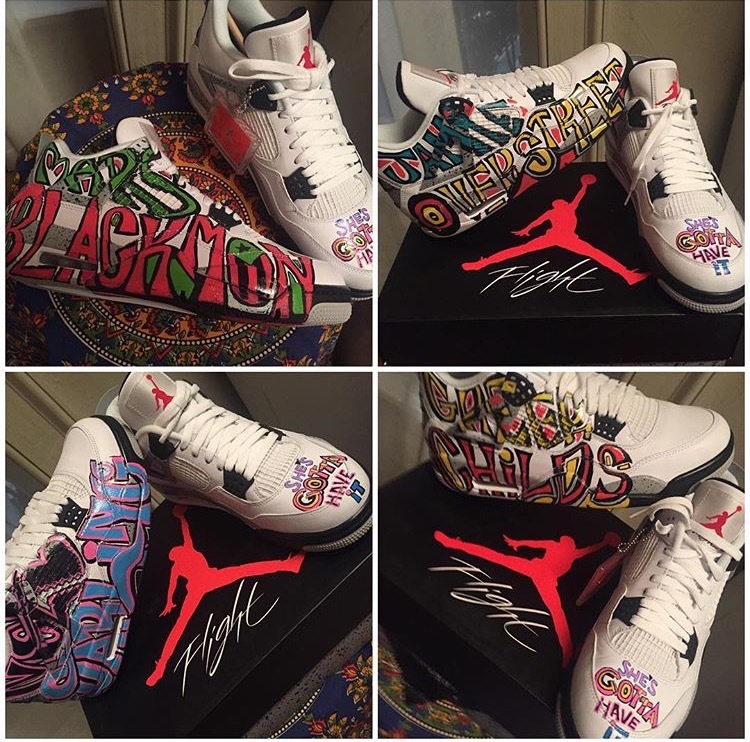 “I think it was a last-minute idea, so I had to move quickly,” said Mastrion, who customized her first pair of sneakers several years ago in a live-painting sneaker competition at the Brooklyn Hip-Hop Festival, which she won. Since then, she’d occasionally done customs through private commissions, but not for anyone quite as famous as Lee. The next day, Mastrion hand-delivered the boxes to Lee at the studio in Greenpoint, Brooklyn. He opened them to the sight of each name of the main characters in She’s Gotta Have It — Nola Darling, Mars Blackmon, Greer Childs and Jamie Overstreet — fluidly freestyled on the outside of each pair’s right shoe in vibrant red, green, pink, blue turquoise and yellow. On the toe of each left shoe was the She’s Gotta Have It logo. For NBA All-Star Weekend in New Orleans, Lee needed a fresh pair of kicks. He discussed his ideas with Andersen, who relayed them to Mastrion. This time, she picked up a pair of “Black History Month” Retro Air Jordan 1s, in 9.5. Spike’s size. Again, she had 24 hours to complete the request. Yet unlike the Jordans she did for the She’s Gotta Have It cast members, Mastrion didn’t freestyle Lee’s shoes. He knew exactly what he was looking for, and Andersen passed along the instructions through copy-and-pasted texts to Mastrion. Lee wanted the shoes to reflect his protest of Trump. He wanted the words “Repel Agent Orange” and “Resist” on them. In big, bold and clean letters. “He gave me specific directions on the colors, on the lettering and the placement, so that he really oversaw the creation of sneakers. He had a very clear vision in his mind what he wanted them to represent. He gave me a lot of directions for those,” said Mastrion, who researched historical Cuban, German and Russian propaganda posters to ensure that she got the bold lettering just right. The words, depicted on both sides of each shoe, were done with Posca, Molotow and Deco paint markers — “Repel Agent Orange” painted in red and “Resist” painted in white, both gone over with acrylic paint and brush, to complement the gold Nike Swooshes on the shoes. When it comes to sneakers and politics, there’s been a long-held notion that the two should function on a separation-of-church-and-state basis. It’s a concept primarily driven by the infamous quote, supposedly from Michael Jordan: “Republicans buy sneakers, too.” This is something that he may or may not have even said, and if he did, it was a joke. But, in the past year, a few titans of the sneaker world have spoken out on social issues. Last summer, in the wake of the number of shooting deaths by law enforcement of African-Americans, Jordan said he could “no longer stay silent.” In late January, Nike CEO Mark Parker issued a statement on the company’s behalf condemning Trump’s Muslim and refugee immigration ban. A few weeks later, Lee felt the need to speak out through the artistry of his sneakers. RESIST – REPEL AGENT ORANGE. DATS DA PUTIN TRUTH, RUTH. YA-DIG? SHO-NUFF. BY ANY MEANS NECESSARY. Shout Out To My Man Busta Rhymes. Special Shout Out To Tip, Ali And The Rest Of The Tribe. Artwork By Danielle Mastrion. “I was so happy and thankful he did a post,” she said. The next day, Lee posted on Instagram again. This time, it was a photo of him, as Mars Blackmon, and Michael Jordan from their old ad campaign days. In the caption was a fun fact about the greatest of all time that few people know. “Happy Birthday To The Greatest Of All Time, Michael Jordan. He was Born 54 Years Ago Today At Cumberland Hospital In Fort Greene, Brooklyn.” Lee, Mastrion and Jordan. All three connected — all children of Brooklyn.